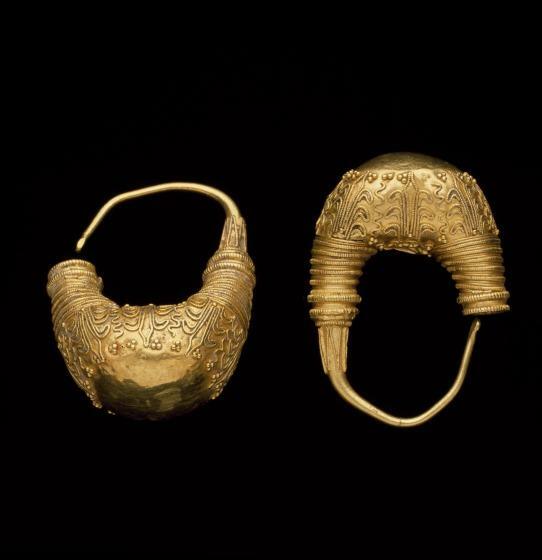 During the late 5th and the 4th centuries BCE, artistic talent and extraordinary craftsmanship met to produce the most magnificent Greek jewelry known. The finest goldwork of this period comes from peripheral regions of the Greek world, while there are hardly any finds from mainland Greece. It has been thought that there was a shortage of gold in Greece during the Classical period, but restrictive burial customs are a more likely explanation. 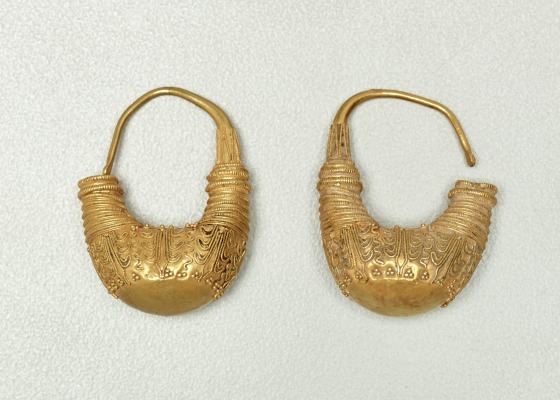 Splendid gold jewelry has been discovered in Thessaly, in Macedonia, and in southern Italy, where, for instance, this pair of boat-shaped earrings originated. 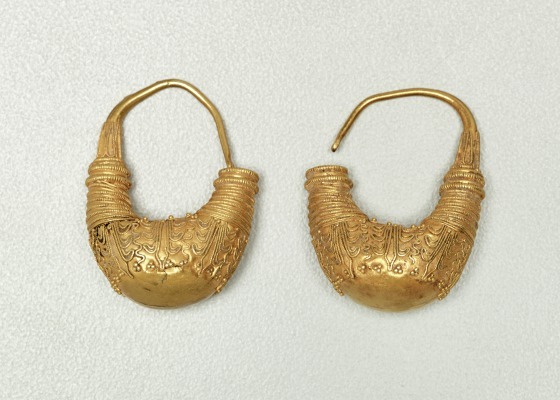 Each earring has a hollow, boat-shaped body. Circlets of plain and beaded wire are coiled around the upward-pointing ends. A suspension hook, attached to one end, is reinforced at the base with pointed tongues framed with fine beaded wire. The hook's tapering end, shaped as a snake's head, can be inserted into a circular opening in the other end of the earring. The boat-shaped body seems to have been made from a single sheet. The seam on top is covered by a gold sheet shaped as a small palmette, which is flanked by two S-volutes in beaded wire. A granule is set in the center of each volute. The body itself is embellished by a frieze of palmettes alternating with undulating lines, both rendered in beaded-wire filigree, and by clusters of granules.